Garlic and chives are nice, but there is much more to this recipe than the title suggests. Take the Parmesan for example. Some people even claim it to be a superfood, but we will let you decide that for yourself. What it does here, is hold all the ingredients together, and it does so in the most irresistible way. We’ll share with you a couple of secret cooking tips: if you substitute some Dijon (or any other mustard) for a portion of the ghee, it will be a complete game-changer. If you hold on to the fact that Parmesan is one of the best things ever invented, then you can bump that up to half a cup, or more, for a crispier crust – and if you broil on high for the last couple of minutes, your chops will emerge beautifully golden brown. Take a peek every now and then to prevent it from scorching though! And what do we suggest to serve alongside these incredible Parmesan crusted pork chops? Well, bacon wrapped green beans are always a hit in our home, and not just because they look pretty on the plate. To balance this protein-heavy portion, a generous serving of creamy mashed cauliflower with a hint of garlic and chives will add a gentle amount of carbs, at the same time giving you substance and forkfuls of flavor. Take bites of pork and cauliflower together, and wonder at the marvel of home-cooked food. Season the pork chops to taste with sea salt and freshly ground black pepper, then place in a baking dish. Combine the chives, garlic, onion flakes, Parmesan, clarified butter, and olive oil. 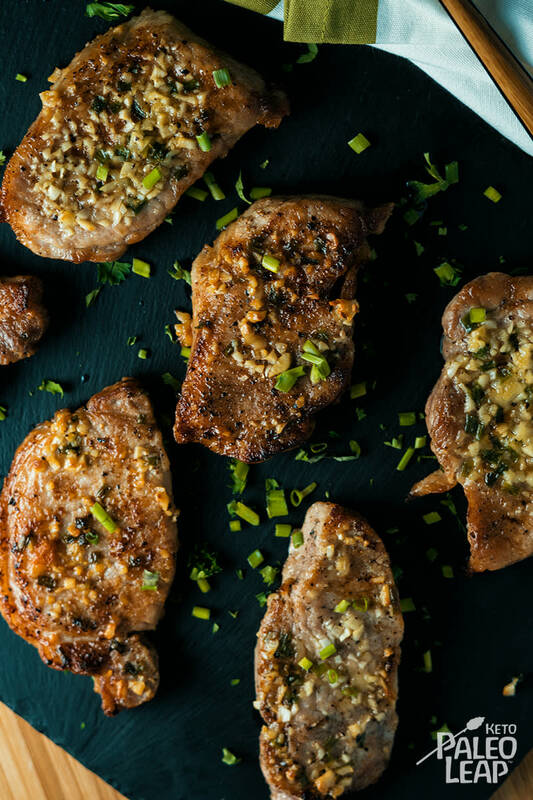 Top each pork chop with a portion of the garlic-chive mixture, using only half of the total mixture, and place in the oven. Bake 15 minutes, turn the chops over, and brush with the remaining garlic-chive mixture. Return pan to the oven and bake 15 minutes longer. Let rest 4 to 5 minutes, and serve topped with green onions.